8 year/s ago 1182 Visit WebsiteInformation TechnologyBroken link? 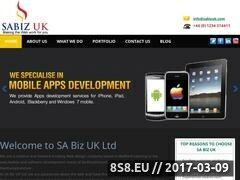 SA Biz UK Ltd is a Bedford based company providing umbrella services to the IT Consultants working in the UK. Unlike most of the umbrella companies who charge you on a percentage basis,we charge you a flat fee based on your daily rate and duration of contract ,which works out to be much lesser than the percentage basis. At SA Biz UK, you will be having a dedicated account manager and are assured of a high quality service,timely payments and honest service which is the key element to the Umbrella services sector. Sorry, BrowseInter.net Website Directory does not contain yet any other websites related to Bedford, MiltonKeynesd or IT Consultants!